Lorena Krasiki (Mariana Klaveno) and Bill Compton (Stephen Moyer) in 1926 (True Blood, Season 2). Image via Va-Voom Vintage. 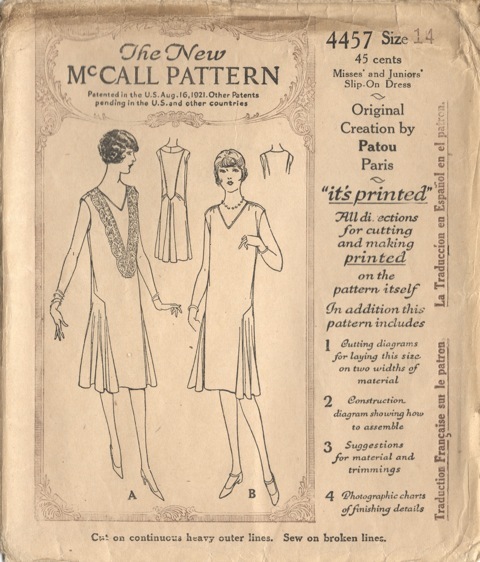 This Halloween I decided to try out a few of my 1920s McCall’s designer patterns. I pulled four patterns to make for me and Naomi: one dress and simple piece of outerwear each. We thought going with a hybrid flapper/vampire theme would make things more interesting. We were also inspired by the Twenties incarnations of Lorena and Bill in True Blood. All four patterns are from 1926—coincidentally the year of Bill and Lorena’s Prohibition-era partying in the HBO series. Naomi’s dress is made from McCall 4457, a Jean Patou design for a lace-embellished slip-on dress. McCall 4457 by Patou (1926) Slip-on dress. McCall 4457 in the McCall Quarterly, Summer 1926. Image courtesy of Debby Zamorski. 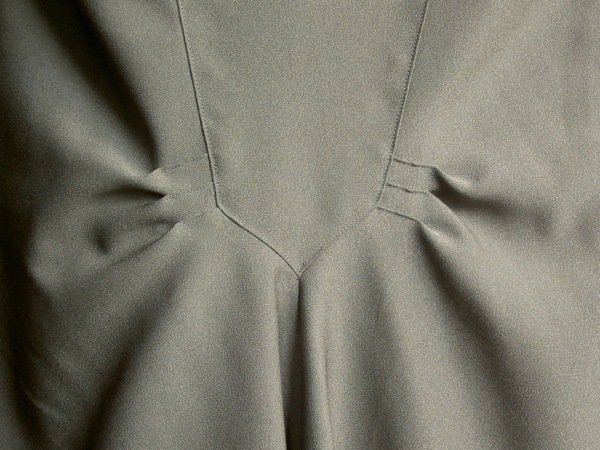 The dress features geometric seaming detail at the hip and small of the back, where small pleats radiate from a pointed inset. The skirt is very full in the back, and the pattern layout calls for piecing, but I just got a little more fabric. 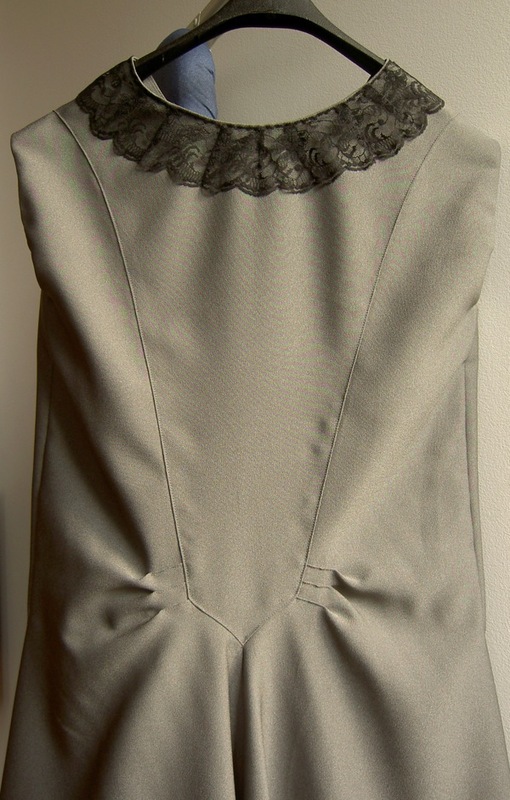 I made the dress up in grey satin-backed crepe with black lace trim. The pattern calls for 3.5″ lace, but we used 2.5″ lace instead. Luckily Naomi is basically a 1920s size 14, so the only adjustment I made was to slash for the next hip size up. Normally I would shorten the waist for her, and I started to make this adjustment to the pattern pieces before I realized they were the correct length. Maybe vintage Misses’ and Juniors’ sizes are good for petites? 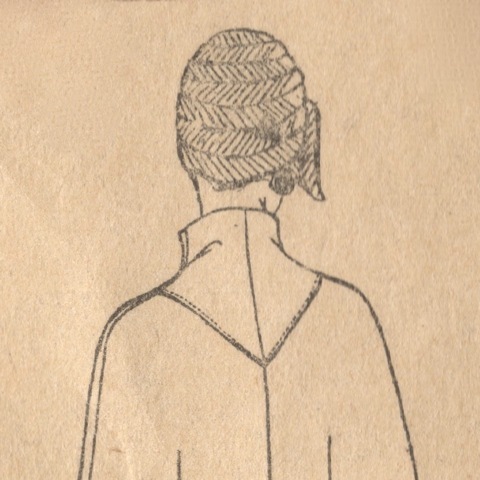 Sewing this 1920s dress was a really different experience. Naomi said she felt like she was wearing a time capsule when she tried on the muslin, and while we were out someone asked whether her dress was vintage! What we both like best about the design is the contrast between the dress’ simple, geometric lines and the lace detail. That tension between old and new (tradition and modernity?) seems to situate the dress right in the mid-1920s. Thanks so much, Lauren! I love your work, of course..
That back detail is fabulous! Thanks! Love your blog banner and avatar btw—Lillian Gish is an overlooked beauty icon..
It’s rare I see a homemade dress that looks so good. Thanks, Ru! It was a really fun project.